This paper is the result of a study of critical factors the Gas Research Institute (GRI) needed to consider in deciding whether to continue R&D funding of a Marine Biomass Project (M BP). The mission of this project is to determine the commercial feasibility of large marine biomass farms for methane conversion and to develop such farms if they prove viable (Aquaculture Associates, 1982). 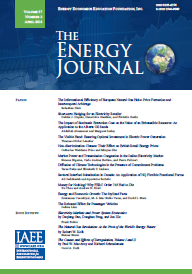 Published in Volume 6, Number 4 of The Quarterly Journal of the IAEE's Energy Economics Education Foundation.